BCDB Rating: "Billy & Mandy's Big Boogey Adventure" has not yet received enough votes to be rated. This page has been viewed 19 times this month, and 3519 times total. Cartoon Characters: Billy, Mandy, Grim, Irwin, Mandroid, Older Mandy, Milkshakes, Some Kid, Sperg, Billybot, Harold, Pale Ghoulish Juror, Chippy the Squirrel, Unicorn, I'll Cut You Guy, Horrorbot, Burnt Skeleton Guard, Peequay, Bride of Frankenstein, Creeper, Horror's Hand, Paperboy, Giant Cyclops, Ugly Pirate, Fred Fredburger, Billy's Mom, Older Irwin, Space Villain, Glacier of Evil, Dracula, Judge Roy Spleen, Underworld Cop, 2 Headed Parrot, Horror, General Skarr, Executioner, Numbuh Three, Miniature Cyclops, Spider Clown Mailman, Beast Master, The Boogey Man, Pirates. Vocal Talent: Grey DeLisle (Mandy, Mandroid, Older Mandy, Milkshakes, Some Kid), Greg Eagles (Grim, Sperg, Pirate #6), Richard Horvitz (Billy, Billybot, Harold, Pale Ghoulish Juror, Chippy the Squirrel), Vanessa Marshall (Irwin, Pirate #5, Unicorn), Maxwell Atoms (I'll Cut You Guy, Pirate #2, Horrorbot, Burnt Skeleton Guard), George Ball (Peequay), Jane Carr (Bride of Frankenstein), Greg Ellis (Creeper, Horror's Hand, Pirate #3, Paperboy), Bart Flynn (Giant Cyclops, Ugly Pirate), C. H. Greenblatt (Fred Fredburger, Pirate #4), Jennifer Hale (Billy's Mom), Dorian Harewood (Older Irwin), Phil LaMarr (Space Villain, Glacier of Evil, Dracula, Judge Roy Spleen, Underworld Cop), Rachael MacFarlane (2 Headed Parrot), George Segal (Horror), Armin Shimerman (General Skarr, Pirate #7), James Silverman (Executioner, Pirate #1), Lauren Tom (Numbuh Three), Billy West (Pirate #8, Miniature Cyclops, Spider Clown Mailman, Beast Master), Fred Willard (The Boogey Man). Directed By Shaun Cashman, Kris Sherwood, Gordon Kent, Matt Engstrom, Eddy Houchins, Sue Perrotto, Robert Alvarez, Russell Calabrese, Phil Cummings, Mike Lyman, Christine Kolosov. Produced By Louis J. Cuck. Written By Nina Bargiel, Jeremy Bargiel, Maxwell Atoms. Music By Drew Neumann, Gregory Hinde. Animation Direction: Joo-Shik Yoo, Kwang Bae Park, Soo-Hyun Park, Hyung-Tae Kim, Jae-Bok Lee. Character Designers: Serapio Calm, Marc Perry, Phil Rynda, Maxwell Atoms. Prop Designers: Mark Bachand, Anna Chambers. Model Clean up: Frank Homiski, Eva Wu. Storyboards: C. H. Greenblatt, Maxwell Atoms, Michael Diederich, Alex Almaguer, Ian Wasseluk, Tara Nicole Whitaker, Chris Headrick, Jay Baker, John Holmquist, Spencer Laudiero. Storyboard Revisionists: Mike Diederich, Tara Whitaker. Additional Storyboarding: Shaun Cashman, Chris Mitchell. Background Designers: Bill Flores, Cliff Voorhees. Background Painters: Joe Binggeli, Don Watson. Overseas Production Studio: eMation, Inc., Seoul, Korea. Puppet Studio: Screen Novelties LLC. Puppet D. P.: J. C. Earle. Additional Visual Effects: Azariah Owens. Director of Production Technology: Antonio Gonella. Sound Editorial: Glenn E. Oyabe MPSE, Jesse Arruda, Glenwood Editorial Inc.
Re-Recording Mixers: Tim Garrity, Brad Brock, Eric Sequeira. Casting & Recording Director: Kris Zimmerman. "Land of the Dead" By: Voltaire. © 1979 EMI Blackwood Music Inc., Irving Music Inc., and Big Mustique Music. All Rights Reserved. Production Assistants: Pietro "Pappy" Piumetti, Ben Pile. Executive Producer, Cartoon Network Studios: Brian A. Miller. Supervising Producer, Cartoon Network Studios: Jennifer Pelphrey. Executive in Charge of Production for Cartoon Network: Jay Bastian. No one was mean to baby animals during the making of this cartoon. Do you have anything to add to this page? Have we made any mistakes... or do you have any additional information about Billy & Mandy's Big Boogey Adventure? If so, we would love to hear from you. Please send us a quick note with your additions or corrections to this page, and we will make the corrections as soon as possible! Do you love Billy & Mandy's Big Boogey Adventure, or do you think it is the worst cartoon ever? Let us know what you think! Surely you have an opinion... so share what you think. Take a minute and post your own comments about this cartoon here. 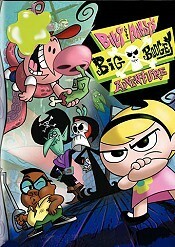 Billy & Mandy's Big Boogey Adventure by Big Cartoon DataBase is licensed under a Creative Commons Attribution-NonCommercial-ShareAlike 4.0 International License.